By chyll2, April 6, 2017 in The Workshop! As everyone knew, the newer DX toys are coming out with a hardpoint already as part of the design. 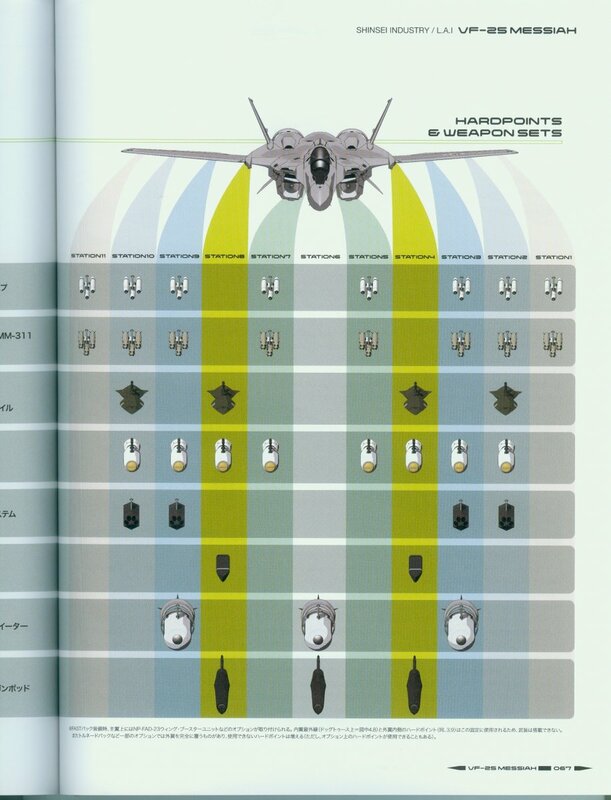 This lead to the inreased price of the Armor Parts of the VF-171 (while the General machine is preferred since it comes with a pair of Reaction missile and a pair of Fold weapon missile). I do feel that the missile in the armor part looks out of place since these are the same design used in Macross Zero. From my observation, there has been a lot of request and there has been speculation that Bandai "might" release a add-on pack. Unfortunately, years have gone and we never really got one. I have been talking to @Xigfrid lately on having to release AMM-101 (similar design in the Hasegawa 25 kit) release a model for shapeway. I think he is almost done with the modeling of the Missile but still have yet to work on the weapon pylon part. This thread will be used to discuss on the improvement on the 3D file Xigrid is requesting for further revisions on how it will be easier to complete the model and maybe further missile request. I am attaching the photo's shared by @jvmacross as reference. I have enjoyed every issue, so as long as they keep releasing them...I'll keep buying them! Doing the 3D model is easy , getting the sizes correct is the issue . If somebody can do a small sketch with some sizes or supply some reference material that will help . We can discuss about size, but I think thanks to the VF-25 Master File we already have a precise idea of the missiles sizes. Concerning the AMM-101, they are supposed to be a little longer than 3 meters, in 1:60 scale this is a little longer than 5 cm. Which translate into a 4mm diameter for the AMM-101. This is really the smallest if you want some strength and room to make attachments. 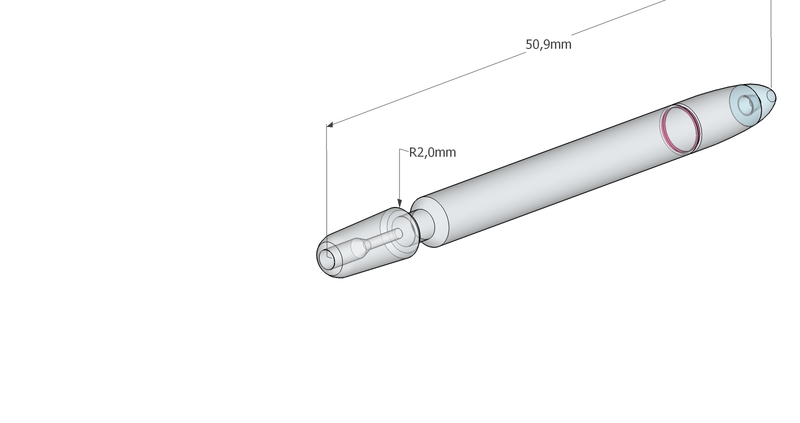 1) When discussing with chyll2, we decided to go with the cheapest way, but still having the option to have the camera and clear tip in the design. 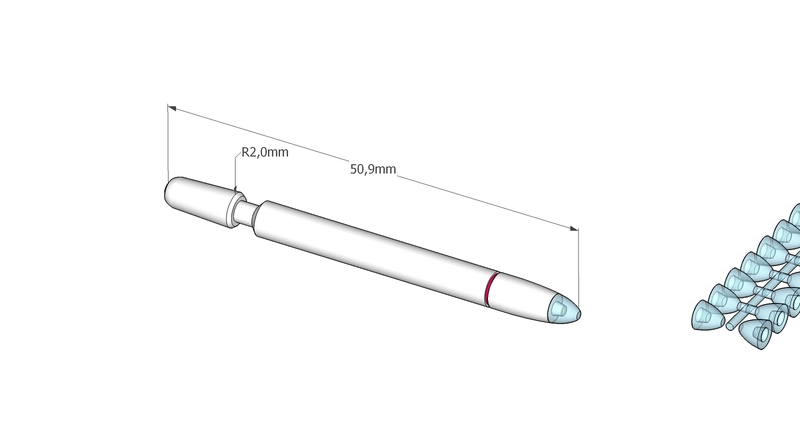 The pack of 18 missiles would be around 20 USD when printed in WSF and FUD for the clear tips. 2) I also included at the rear of the missile inside the thrust a 0.7mm x 4mm hole so you can insret a steel wire to make a flying missile for a dioramas. Though I am not that interested in the AMM-101 missiles, I will probably not test the whole set. BUT I just found that the VHMM (PACSWS-1G) design is growing on me! more reference file, the PACSWS-1G Design is indeed the looker among the set. Those are some expensive missiles, USD20 for 18... not to mention shipping. I'm glad Xigfrid is working on this though, could pick up a set if it turns out nice. Are these the ones? He custom made his with sculpting epoxy I think. That is a fantastic scheme! Would love to know how he mounted the missiles on those DX wings though. In for whatever you make, Xigfrid. Chyll, you read my mind! I just PM'd Xig about this very thing a couple days ago! Magnets and rods. Drilled a couple of holes in that area for a small magnet and guides for the rods then added magnets and rods to the missile. I found a good idea to make the station#4 pylons without ruining the DX paint. But because it needs 1,5 to 2mm thickness to hold tight, I don't think this solution is suitable for the wings. Also the rotating wings on the 25s is troublesome. I guess this is the main reason why the 171 had the attachments but not the 25. BTW, the PACSWS-1G are still hot on tracks! Great! Has anyone figured out where stations 5 and 7 go? I don't see station 7, but station 5 should be like on the tomcats, at the bottom of the intake / legs. 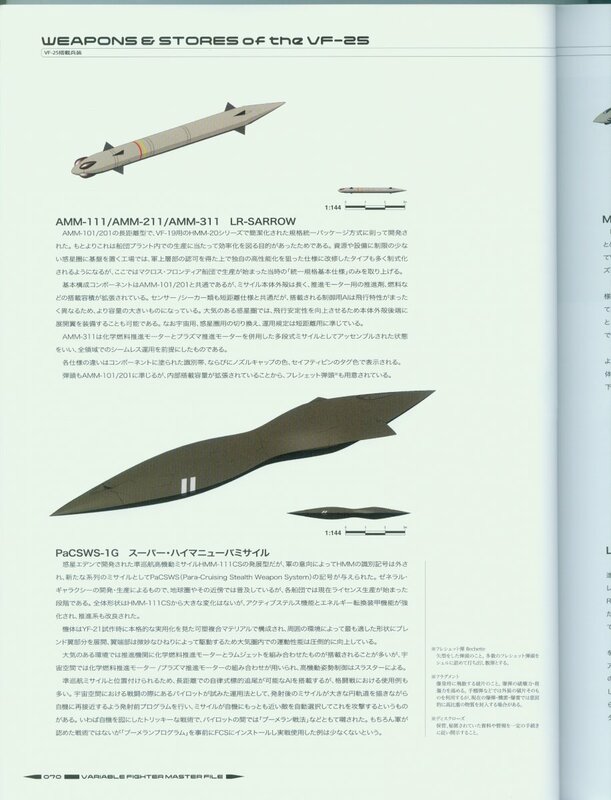 Anyone has more info about this missile ? 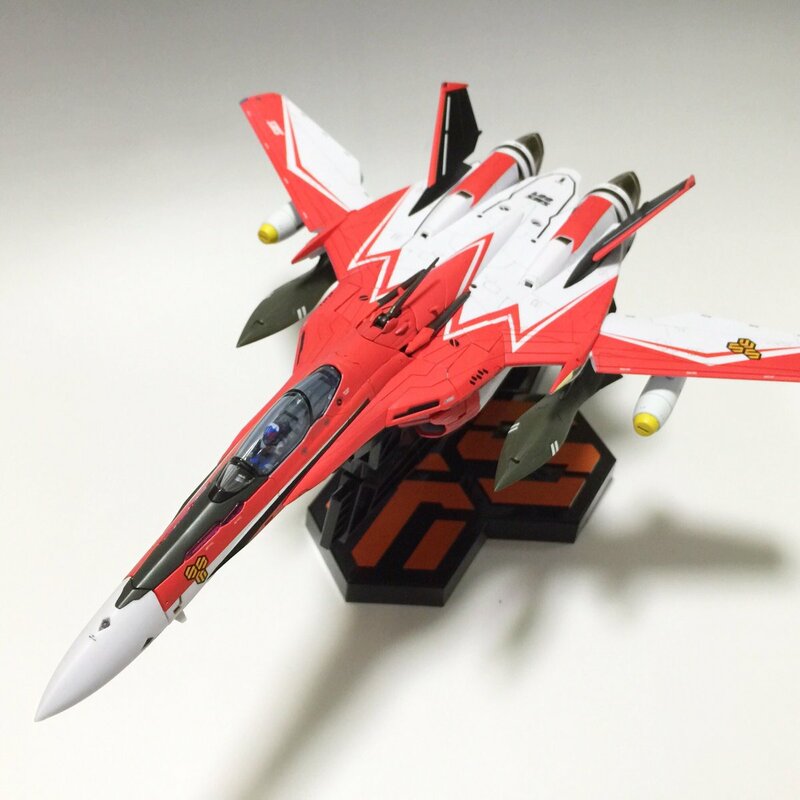 It looks like this is a mix of Macross Plus HMM and the VF-25's PACSWS-1G. AMM 101 ready to be 3D print, I will try fit a pylon and a missile before putting it online. Thanks Xigrid. Looking really good. I thought of a special set of 4x DX attachments, with a flat 9mm x 19mm plate so you can glue anything on it. 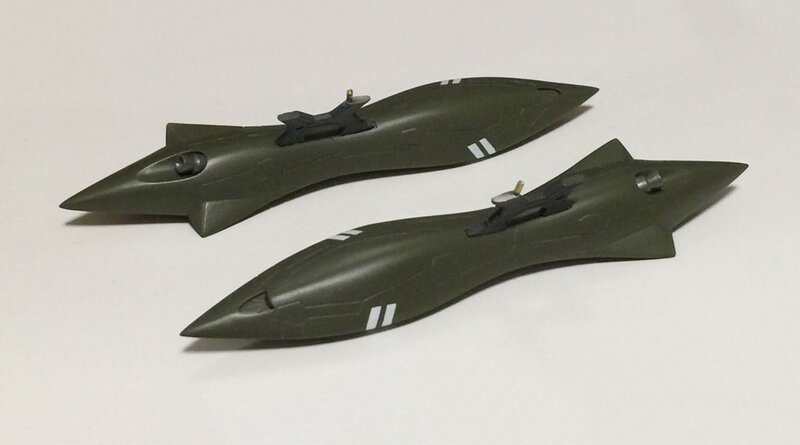 Like a pair of 1:72 / 1:48 plastic model missiles. I should dig out the old pylon models I made for flight simming years back. I built up a few racks based on F/A-18 pylons that'd work with the YF-19's wings. 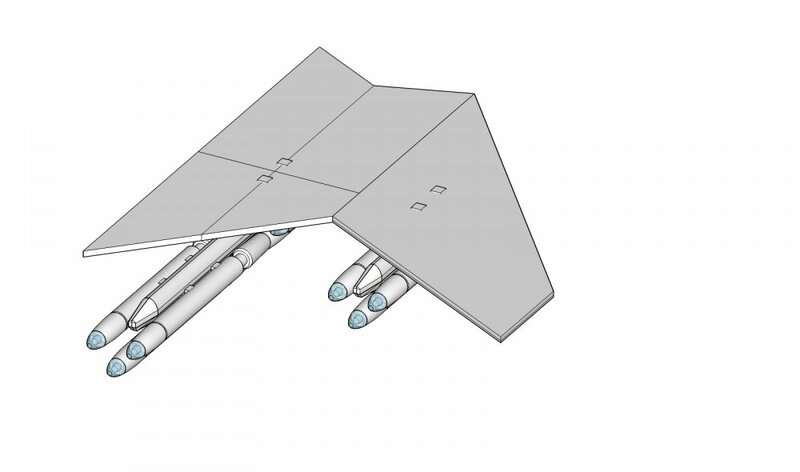 On the subject of the YF-19 though, I'd personally love some Bandai adapters for the Arcadia YF-19 missiles. Though, to be honest, I almost think the existing pylons would fit, if the center post hole on the Bandai valks was drilled out a little. You should check Xigfrid Profile. He is cooking something related to your wish list. Just received the pylon for 3x AMM 101 and one AMM 101, everything is good to go! Missile and pylon freshly printed. Rough but detailled. It should be good with 1 or 2 coats of floor polish. The pylon attachment fits both pegs on the 31J. Here is some hope for the VF-25, pylon attachment Station 4 on the VF-25. Once assembled, the pylon can holds the VF-25 weight! The pylon can be removed and there would be 2x 1mm diameter holes, nearly invisible. 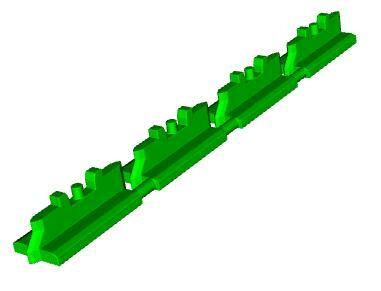 1) Kit for 18x AMM-101 on shapeways. 2 versions will be available, one with the clear tip, the other one cheaper without it. Any idea, I can examine it? Generic female UN Spacy pilot that can fit into DX cockpits as the pilot or backseater. A closed up VF-25 gunpod that can be mounted on your new Station 4 pylons, to replicate the Master File's loadout of 3 fun pods. Nice stuff so far, Xigfrid!! Female pilot: I don't how to make that with sketchup ? That's fine. It was just an idea. I could send you my Grace O'Connor pilot to scan and then modify but I don't know if that would actually help. Well you can try one of these 1:72 pilot kits, or preiser/Noch painted figures, by just adding the helmet with some putty. you will obtain a better result. The only good printer at shapeways for this kind of figure would be FUD or Black Acrylate HD with sprues, that means 10$ a pilot or printing a batch of 10/20 units and reselling these individually. Anyone want to do a replacement VF-27 quantum beam gun? I warped mine terribly trying to fix a bit of a lean in hot water. Further attempts at fixing it resulted in some pretty terrible disfigurement. We could potentially fix some of the size issues while we're at it. I've always thought it a bit big. Not just in fighter mode but battroid too. Making a replacement is possible but it would be a PITA to sand it down for glossy paint. And being pretty large, it would cost approx 45-50$ at shapeways. At this price point I think I would have gone with te other solution which is to buy another 27 and sell the one missing the gun. Very good insight. I was thinking it could be done in multiple parts to better deal with the sanding issues (the pink parts could be moulded to fit into the inside surface of the beam parts. Send me in PM a few pictures of your gun and what needs a replacement, if there is just a few parts it can be worth it. -set of 4x flat section pylons for general use for VF 30, 31 and 171. -?? 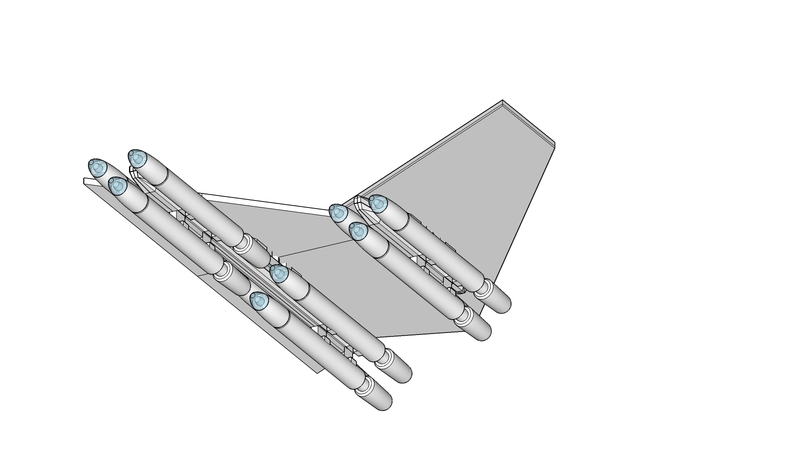 Sort of triangular missiles as per the cover of "Variable Fighter Master File VF-31"